I remember being in grade school and anticipating every weekend. Of course, there was no school, but it also meant that I got to watch two Oakland A’s games without being told it was time for bed. The summers were even better, since that meant no school at all and every game was now a possibility. Like most other boys my age, I often daydreamed about being the starting shortstop for a World Series winning team. It’s funny how no one every dreams about being a middle reliever! I found my love for baseball in the late 1980’s, right when the Oakland A’s were beginning a short-run of success, which included three World Series appearances and one championship. It was easy for a kid, my age, to fall in love with the players wearing green and gold at that time. I saw myself batting clean up, right behind Jose Canseco and in front of Mark McGwire. I visualized completing double plays with Tony Phillips, Walt Weiss and Mike Gallego. Of course none of that materialized, but it didn’t stop a lot of us from fantasizing anyway. So why is baseball still so beloved by many? It can’t just be because it happens to be the oldest organized sport, if only comparing it to hockey, football and basketball. No, the answer to that question lies much deeper. Most people have a time in their life when something became important to them. We all can remember where we were at when JFK was assassinated or Martin Luther King Jr (if we were born, of course). Where we were at when we heard about the deaths of Elvis Presley, John Lennon or the devastating attacks on the World Trade Center. Since we are most heavily influenced in our youth, it is easy to see why we find love for one thing and not another. For example, I love sports and was encouraged to not only play them, but collect trading cards of my favorite players and team. In turn, my dad was not an outdoors-man. He never worked on cars and was not comfortable with a tool belt on. So I hate camping, fishing, going to the beach, doing any type of handy work (not that I could anyway), and love sports, numbers and statistics, as a direct result of my childhood influences, or lack thereof. Most people have a special connection to baseball. Most of us played little league or some fashion in an organized form. Some of the baby boomers might remember listening to the game on a radio with their dad or grandfather. The style of game play is much more family oriented, for casual observers. Most of us found ourselves in our backyard, practicing our fastball, or mimicking the batting stance and swing of our favorite childhood player. The old saying goes that baseball is as American as apple pie. Of course, not every sports fan would consider baseball as their primary sport of choice. 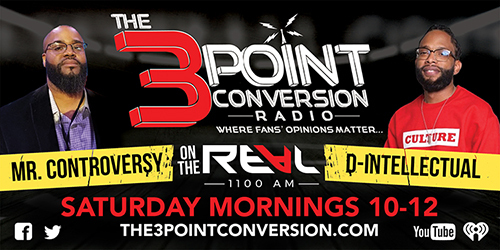 In fact, I would imagine most readers on “The 3 Point Conversion” would lean towards football or basketball, if not both, first. Regardless of where personal allegiances lay, the pressing question is why is baseball still the national pastime? If we look just on a popularity level, wouldn’t we have to give the nod to the NFL? What makes the NFL so unique is its compressed schedule. You only have to follow for a day or two (and now Thursdays, too! ), 20 times a year. The league has gotten so popular that there is always something going on 365 days a year. With the new year-round focus, the NFL is always on the forefront of our minds, regardless of where we are in the calendar. Let’s not forget that fantasy football has done its fair share to increase the overall popularity of the sport. Full disclosure, fantasy sports, once known as rotisserie, began with baseball. We all know that the NBA is all about June. We don’t need to watch a whole NBA game. We just need to watch the final five minutes. We don’t need to pay attention a whole bunch during the regular season, as we know all of the action starts in April and ends in June. Hockey is much the same, with a bit more parity. Does anyone think a NBA team not named Golden State, San Antonio, Cleveland or Oklahoma City has a chance to win the championship in the 2015-2016 season? Of course we don’t know that any of those four teams will win the NBA Championship this year, but c’mon, we do know, and it’s only February. Baseball is, and always has been, a game of chess. Unlike football where players are put in a strategic position, just to smash into one another, a beautifully orchestrated play might get nullified because someone flinched along the offense or defensive line. Football is as exciting as any, in the eight to ten seconds most plays develop in. Basketball, the ultimate one-on-one match up, where you pit your skills versus that of another. A game, where passing and shooting can often remind someone of a perfectly crafted classical opus. The ebb-and-flow of the game can be an amazing thing to watch… Well until the final few minutes when coaches begin fouling players for “strategic” purposes. Baseball is all about defensive alignments, waiting on the catcher to call the right pitch based on the batter in the box, then watching to see if the pitcher can hit his target. Even if all goes perfectly right, we still might see the ball end up 400 feet into the left field stands. Please don’t get me wrong. I love football and basketball as much as the next guy (or gal). It’s just the heritage and love for the game isn’t as deeply ingrained into the heritage of American history. Baseball tells America’s past. Baseball preludes to America’s future. Most sports fans can remember Cal Ripken breaking Lou Gehrig’s consecutive games streak, or Joe Carter’s infamous World Series winning home run. We all know the shot heard round the world. We know that the Mets won the pennant, can recall Hank Aaron’s legendary trot around the bases when he broke Babe Ruth’s career home run mark of 714, in 1974. We know what the numbers 73, 762, 4,256, 56, 2,130, 27 mean to the game of baseball. We debate Mays vs Bonds and Ruth vs Mantle. Baseball is the only sport where you can put a framed 8×10 of a player in a uniform of your least favorite team on the wall. As an A’s fan, my walls adorn the likes of Babe Ruth, Lou Gehrig, Eddie Matthews, Ty Cobb and Walter Johnson. As a Raiders and Spurs fan, you would never catch me hanging anything that represents the Broncos, Chiefs, Chargers, Mavericks, Lakers, Rockets or Jazz.